travel frequently to where the teacher lives. In the 1970s, Karen Mathieson, then a teenager, would take a torturous bus trip from Eugene, Oregon to Seattle for her twice-monthly lessons with Lynne Wainwright Palmer. She would leave home at midnight, arrive in mid-morning, be fed breakfast, have a lesson and lunch, and then get back on the bus for the long return trip. wait until a teacher comes through on tour. Mildred Dilling would perform concerts in the evenings and give lessons by day, and was an inspiration to Louise Trotter when she visited Texas. Many of today’s concertizing harpists do likewise. move to the teacher’s location. Indiana University’s Susann McDonald, Seattle’s Mark Andersen and Boston’s Carl Swanson went to Paris. Dan Yu came from China and Isabelle Perrin from France to study with Ms. McDonald. This still goes on, of course. For several decades technology has also played a part, with a few teachers and distant students making and exchanging 8-track tapes, then cassettes, CDs and DVDs in a better-than-nothing attempt to share knowledge and performance when an in-person experience was not possible and long-distance phone calls were prohibitively expensive. When I began teaching Celtic harp, I followed the pattern of teaching that had been ingrained in me for the past 35 years. It wasn’t until I was asked by Pamela Bruner to edit her three books, “Play the Harp Beautifully”, that I consider that the methods to teach, specifically Celtic harp, could be different. I marveled at the wonderful pictures and thorough explanations in her books, but also wondered if people could really learn to produce quality tone from a book and pictures. At the same time, I viewed some of the VHS and DVD teaching videos available on the market. While many were of high quality, there was an essential part missing; a live teacher beside one’s own harp. I concluded that the immediacy of teaching, correcting or affirmation cannot be duplicated by self-study books or VHS/DVD instruction. Teaching harp at my harp studio in Richmond, VA proffered my students with the accessibility of a teacher that could interact with them; one that could teach, correct or affirm. It is when I travelled and taught workshops that I often heard from students who wished I lived closer to be available to them for harp lessons. 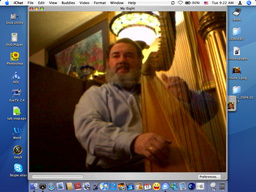 When I learned of Skype, software that allows for video phone calls on a PC utilizing Internet technology, I immediately recognized that I had the ability to reach out to many book and video frustrated harp students. Of course, VOIP and the electronic tuner are not used only by harpists, but how they can change our lives! We no longer need a silent room for tuning, and we no longer have to be sitting beside a student in order to teach. We can now connect with students or a master class a few hours, a country or a continent away without leaving home. Once all parties have the proper equipment, you might be able to schedule a lesson with a teacher whose recordings you’ve admired, or rehearse with a distant flutist, or composers could confer with a harpist on the playability of what they have written. The possibilities are many. The university wanted to determine the feasibility of doing long-distance master classes for students at schools with similar technology. The first time, I brought my harp, bench and music stand to the studio and taught a private lesson to one harp student from McGill University in Montreal. McGill has the same high-tech equipment as UBC, so it worked uncannily well! The staff set up the microphones for the harp and for my voice. The lighting and the cameras were set up so that I could see the student's entire body from one side. If I needed to see the other side, they could adjust the cameras' position in the Montreal studio, but it was unnecessary. The effect was amazing. It was as if we were in the same room, but separated by a large window. There was no delay in the sound, nor any problem with tone quality. I could do all the things I do in a regular lesson! I had my own copies of the music she was studying, but we could hold the music up to the camera to show markings. The experiment was such a great success that I did a master class for Mount Royal College in Calgary next. Their equipment was not quite the same, but still worked well. The photo below was taken from their side. In both the private lesson and the master class, the students were intermediate to advanced. If I were teaching a beginner, then a movable camera would be helpful for checking if a right elbow was drooping. All in all, I felt that this was a very useful idea, and I hope to do more of it in the future! I went to UBC Telestudios web site www.telestudios.ubc.ca and found this description, I also found myself on their little video clip when you click on videoconference! Broadband network connectivity with cross-platform compatibility. Cinema quality large screen and multimedia video projection system. Teleconference facilities for audio-only conferences. Web collaboration for real time file sharing. The studio is equipped with a lighting grid to cover all angles. The production control room facilitates production of live, or live-to-tape broadcast quality events. The post production facilities make it possible to create videos with graphics, transitions, music, and special effects. Now the technologies like VOIP / Skype allow us an audio and a video connection from our own homes using a computer, downloadable software and a WebCam. Here are some reports. After trying out several solutions including a hardware video-conference from the phone company (quite expensive) there came to my attention a new internet service called Skype. A part of the Skype software package includes video calls at no charge so I decided to give this a try. I visited www.skype.com and downloaded their software for Mac OS X and installed it within ten minutes following the very easy to understand step-by-step directions. Since my Mac computer has a built in webcam and speakers, I was in business and running slick as a whistle in less then 15 minutes. Once we all got Skype installed we found that we could open the software at a predetermined time and sit in front of our computers. We went down the list of "friendly" users and clicked on each other's names in the list. You must of course add the users to your "friends" list so a few emails back and forth to share your screen names was in order. After clicking on our names we found ourselves sitting in front of a nice video picture on screen that was amazingly like being there in person. I was even able to "see" one of my students pointing at my harp to ask a question about a certain string. There's a feature that also allows you to "record" a video session so that either I or the student can "re-play" a portion of the lesson at a later time. I can also do multiple students by opening several Skype windows and arranging them on my screen so that they do not overlap. The students can talk to each other as well. The sound varies from computer to computer according to the speaker setup you have on your particular system. I have a quite advanced audio system and the sound is pretty fine, fine enough to hear the difference between a well placed finger on a string and a finger slipping off gently. I can easily hear a buzz or pedal slide. The best feature of all is that Skype is totally free to use (unbelievable) and the only thing you have to endure is a few "commercials" at times. None of these interrupt your video session. Skype also offers a slightly enhanced version for a small fee if that becomes desirable. All in all I have found Skype to be a wonderful tool. The biggest downfall happens to be the social aspect in that once we get connected on line it is easy to forget about the true purpose of the session and just start chatting. You will also want to be careful about giving out your Skype screen name so that you don't become the recipient of calls on line while you are trying to teach. if you do give out your screen name to friends and family, be very clear with them about the etiquette involved with teaching so that they do not feel slighted if you don't acknowledge their incoming calls at times. Once I used Skype to teach a class on French interpretation to a group in Maryland from my studio at the time in Kenmore, WA. They wanted me to talk with the students and listen to them play but they did not have the funds to fly me out there. We had a screen set up on both ends and I actually found the video to be quite clear and close enough for me to critique hand positions easily. The only thing I found lacking was the clarity of sound I would have liked to hear. But, what was there was sufficient with which to teach. It was my first long distance master class and they booked another one as a follow-up. 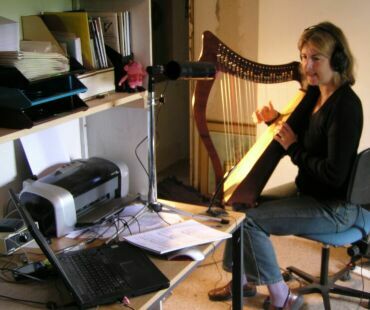 Sarah teaches Celtic, pedal and medieval harp and is the director of the Cornwall Harp Centre, and she offers on-line lessons via Skype. She recommends that on-line students attend at least one weekend residential harp course at the Cornwall Harp Centre per year. This is encouraging for those studying alone, it boosts enthusiasm and it’s always fun to meet other learners and on-line harpists. It’s also a useful time to discuss in person with Sarah any problems on technique or theory. You can study to enter the harp exams from Grade 1 - 8 run by the Associated Board of the Royal Schools of Music. Sarah recommends music from the ABRSM stipulated lists and goes through it in your lessons plus all the required scales and arpeggios, bringing you up to the required standard. Aural tests required by the exam board can be practised using CDs produced by the board. For overseas students who visit UK frequently, Sarah can enter you to take an exam in Cornwall, exam sessions run three times a year on specified dates, and you can stay at the harp centre for a few days before your exam and have extra coaching in advance. But in some countries these exams are already organised, (contact ABRSM direct for enquiries)- In this case you can enter yourself on-line. The ABRSM are internationally recognised by all musical institutions, their exam system is a respected qualification, and if you are successful you receive a certificate and notes from the examiner. Please note, for anything above grade 1, you will need a 36 string Celtic harp as a minimum size and lessons will need to be an hour. I find that my Skype students are among the most dedicated students I have. They come to me full of ideas, requests, and questions, enthusiastic about how I can help them. Online lessons represent a huge leap forward from DVD lessons because they allow feedback in real time and give students that missing piece: someone to observe what they're doing. The webcam allows me to see why a passage is or isn't working, suggest alternatives, and watch students try to implement them--the same things I do at a lesson in my studio. I see the student full screen and myself in a little window, so I can see that my own hands are visible when I’m demonstrating a technique. The student, of course, sees me full screen and their own image in a small window. Are there drawbacks? A few. I certainly can't put my hands on a student's hands to physically adjust them, but I've found that I can watch a student copy what I'm demonstrating and suggest the changes verbally. I was initially skeptical about whether the sound and image with Skype or any free software would be synchronized enough to allow me to hear exactly what the student plays, in real time, but the software does fairly well. Occasionally a connection is staticky, but I have found that hanging up and calling back solves that issue. I have had one student unable to get her camera working with Skype, and I know that one needs a fast connection to make it work. The Skype site has all the technical details about that. Skype is easy to install and the website’s Help Section provides assistance for installation and setup questions. The minimal requirements, as well as the optimal requirements, are posted on the website as well. The software is available at no charge and video phone calls, PC to PC, within the U.S. are free. 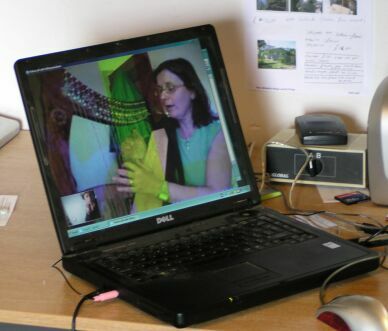 The primary advantage of using Skype to teach harp is that I can reach people who would either (1) want to take harp lessons from me, (2) live quite a distance from a harp teacher, or (3) wish to have harp coaching sessions after attending one of my workshops. Many of my students are those that either live quite a distance from a harp teacher, or are students from workshops that wish to continue with the lessons they learned. For example, I have students in Florida, North Carolina, remote parts of Virginia, and Connecticut. 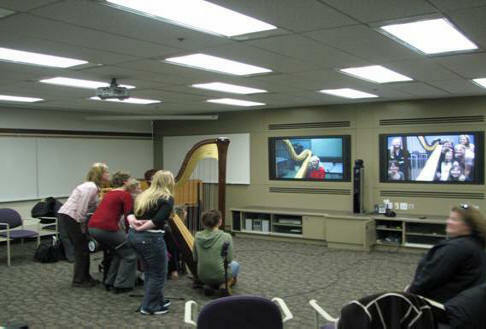 I find that the other advantages of using Skype are that (1) the students can play on their own harps, (2) the students do not incur any expense in travel, (3) there are fewer missed lessons because of inclement weather conditions, and there is always the immediacy of feedback and affirmation. 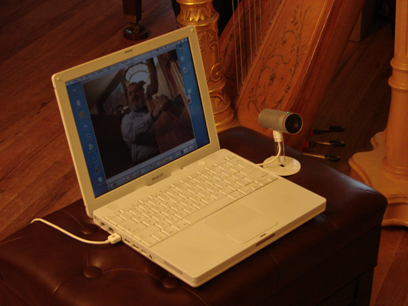 If there were any disadvantages to using Skype, it is not being able to reach through the computer screen and place a beginner’s fingers on the harp strings. However, I have been able to find ways to communicate and work around that being a necessity. The advances in technology have proffered businesses across the world to make use of technology to hold video-conference meetings, just as colleges and universities have harnessed Internet technology for distance learning. I think that it is the wise consumer and harpist that can embrace the new technology offered by Skype to go beyond what books, VHS or DVDs once presented. Distance learning for the harp is accessible and available; the reasons are multi-fold for many individual harpists, while the time is now! courtesy of Southeastern Harp Weekend at southeasternharps.com, whose home page has a sign up link for the Harp Tips newsletter. Laura Goldstein enjoys working with harpists of all levels, both lever and pedal harps, and teaches by Skype as well as in person. More information about her teaching philosophy can be found at lauragoldstein.info/lessons. First lesson is free. Felice Pomeranz says "To reach many people over long distances, Skype lessons are fantastic and very helpful! I simply love teaching, and students can be of any level, from beginning to more advanced. I teach many styles, from classical, to folk, celtic, rock, jazz, and more. We can study harmony, improvisation, rhythmic skills, composition, reading lead sheets, and technique. I assist harpists on lever or pedal harp and have many tips for making your pieces come alive!" 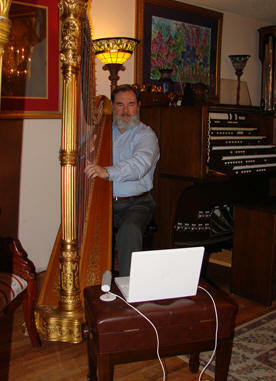 Laurie Riley teaches for many varieties of harps: regular nylon, double-strung, gut or carbon-fiber-strung lever harp, wire-strung, therapy harp, and electroharp. She is great with adult students via Skype, all levels: beginner, intermediate, advanced, and professional. Lessons focus on your particular needs and wishes.